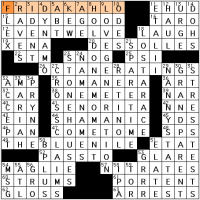 What a cool debut puzzle: There’s a string of PALINDROMIC WORDs running around the perimeter of the grid. Are you a sucker for palindromes, too? I’ll bet you are. The border answers include the family set of DAD, MOM, and SIS (BRO is here too but sits alone at 59a, left out of the palindrome party); “PIP-PIP!” ([Brit’s “Goodbye!”]); and DEED, LEVEL, MINIM, TENET, TAT, TOOT, REDDER, and SOLOS. I like the palindrome trick, but I’m also fond of the fill. LENA OLIN glories in having her full name included for a change, instead of her crossword-friendly first or last name alone. U.S. ARMY is a solid entry, and much better than the Army’s URL, goarmy.com. “I will never shop there again. The selection was positively goarmy.” See? It doesn’t sound good. The absolute best entry is “I’M TELLING,” the [Schoolyard snitch’s words]. Also evoking good thoughts are George CARLIN, NUTMEG, Hank AZARIA, L’CHAIM, and the word SMUDGE. Then there’s the [Family name in Chicago politics], DALEY; the outgoing mayor’s brother Bill might take mayoral candidate Rahm Emanuel’s place as White House chief of staff. I’m less crazy about fill like ECU (the [French coin of old]), “IS IT I?”, old-school crosswordese ALAE ([Wings, in zoology]), [English poet laureate Henry James] PYE (never heard of him, but I know there’s a Joe Pye weed), the plural abbreviation CENS (for “centuries”), and OLAF I. I don’t know about you, but I’m making a mental note about this PYE poet. 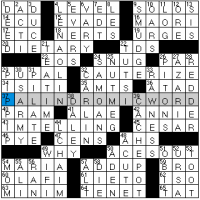 I bet I’ll encounter him again someday in another crossword. One-line review for those in a hurry: The rarely seen abridged maxim theme that goes right to your sole. 1A. [Like serious collectors] – AVID. My wife is an AVID shoe collector. 11D. [Fish also called a sockeye] – RED SALMON. Only long fill 1. 12D. [Candle count, on many cakes] – AGE. Unless there is one more for good luck. 28D. [Tenants’ strike leverage] – RENT. Odd clue. Is it really leverage? 33D. [Places with valuable veins] – GOLD MINES. Only long fill 2. 42D. [Actor with nothing to say] – MIME. Kind of like me on this puzzle. Fill is standard stuff. 45D. [Like some sweatshirts] – HOODED. Is a hoodie the same as a hooded sweatshirt? And what shoes go with that? “Beverage that may be ruby red” is GRAPEFRUIT JUICE, sadly now on my list of banned foods due to my recent struggles with acid reflux. “Why bother?” and WHAT’S THE USE? are both great phrases. “Ceases hostilities” is CALLS A TRUCE. It’s interesting that the sound /us/ has multiple spellings, highlighting the vagaries of the Queen’s English. Anyone for Esperanto? I thought the entries TED TURNER, BOOTLEG (without a golf course reference this time, but instead “distribute illegally”–is this both an adjective and a verb? ), and BOWLS OVER were fun to discover. I had COWHIDE before RAWHIDE for the chew toy material, DART for DASH, and AMWAY before ALMAY for the skin care brand. Renaissance poet Torquato TASSO is definitely some up-market fill, has anyone read his Jerusalem Delivered, written in 1580? Jonesin' crossword answers: "The Big 500"
Congratulations to Matt Jones and his editor, Matt Gaffney, on publishing 500 Jonesin’ crosswords! No, I don’t know why this one’s file name is jnz501 rather than 500. I waited all day for the blogging muse to visit, and she steadfastly refused to appear. (Oh, well.) Matt expanded the grid to 16×16 and monkeyed with the placement of the black squares (asymmetry!) to accommodate a fearsome midsection that approximates an 8×7 grid. 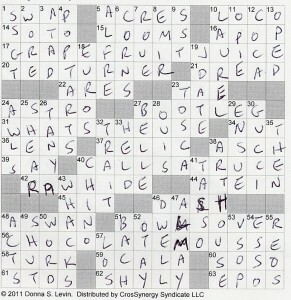 When do you ever see such a crossword zone? Pretty much never, that’s when. Impressive. Highlights: NANNY STATES (despite arbitrary pluralization), SPARE TIME, FRIDA KAHLO, NAME NAMES, HOLD ON A MOMENT, DYNAMO, THE BLUE NILE, and a respectable B PLUS. Not wild about the contrivances LOST A RACE, STONE HOUSES, and an EVEN TWELVE. Smack dab in the middle of my musical ignorance are LADY BE GOOD and LOVE GENERATION. This entry was posted in Daily Puzzles and tagged David Hanson, David W. Cromer, Donna S. Levin, Matt Jones. Bookmark the permalink. I really disliked “cens” for millenium divs., otherwise nice puzzle. I got stuck on CACHEPOT myself, but I liked the palindromism. Very much like “I’m Telling” crossing with “US Army”. Love to think of it as a sneaky “Don’t Ask, Don’t Tell” shout-out…. Thumbs up for David Hanson’s debut. 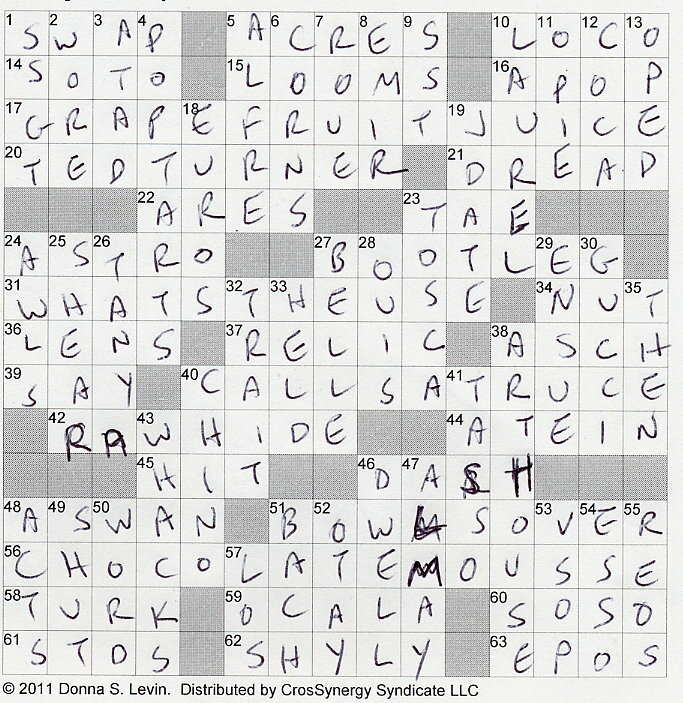 Interesting that Donna Levin’s puzzle contains whacks and otay, each of which has been a cause for recent discussion in the crossword blogs. I used to be able to print out the solution but apparently that is no more, at least on the NYT crossword. What happened?? Joan, can you provide more information? Are you talking about the Across Lite version? Can you print the blank puzzle? Loved that Jonesin’ grid! I didn’t even care that he used my most-disliked “stack anchor”, STRESS TESTS.